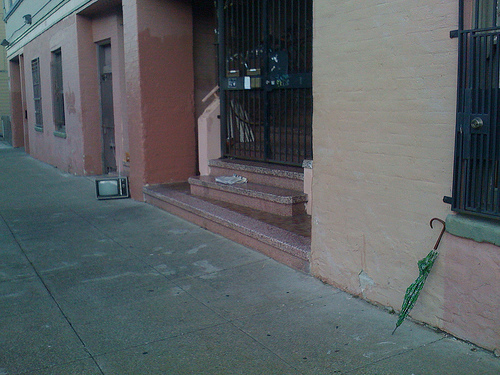 Current collection of crap — a TV and umbrella — left on the street outside our apartment. Tomorrow the TV will probably be tagged and broken, and by Wednesday they will be gone and replaced by some other collection of abandoned treasures. Just think in about 15 years we’ll start seeing flat panels and 40″ LCD’s left out on the sidewalk! And we won’t want them. This morning, I saw an IBM Selectric typewriter on the sidewalk that I would have killed for 30 years ago. Maybe he should call 3-1-1 to have it picked up like a decent human being. …then in another day somoene will have pooped neatly on the top of the TV…seriously, I used to live about 3 buildings down from here.